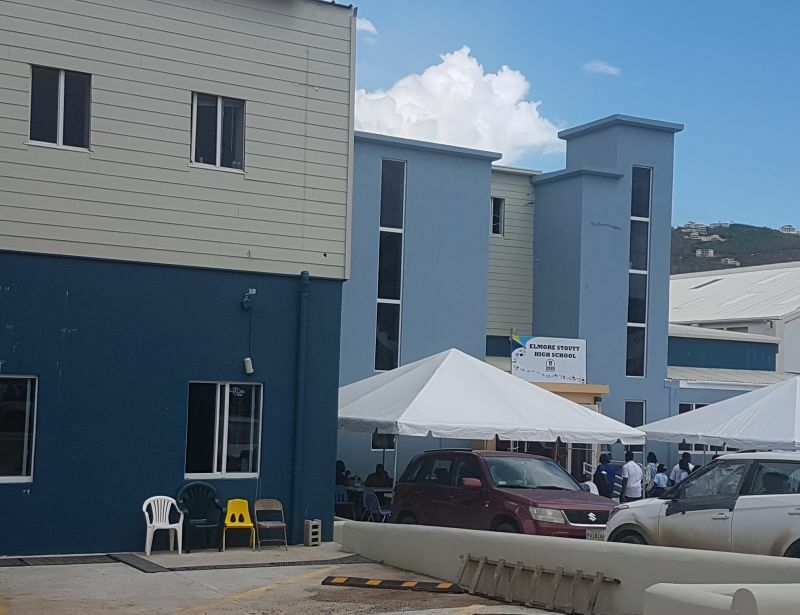 Neglected for two years by the National Democratic Party (NDP) through embattled Education and Culture Minister Myron V. Walwyn, external works to clean up the surroundings of the building has begun as the Premier Andrew A. Fahie (R1) led Virgin Islands Party (VIP) Government make moves to end the current shift system at the institution. 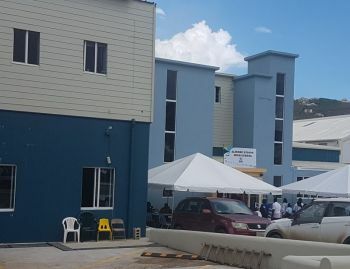 Currently, the ESHS housed at the Old Clarence Thomas building located in Pasea Estate operates under a shift system where the morning shift runs from 8:00 AM to 12:00 PM while the afternoon shift runs from 1:00 PM to 5:00 PM. The system was implemented as a result of damage to the ESHS main campus during the Hurricanes of 2017 and social commentators have long commented that the shift situation is not ideal, especially when it comes to the education of the Territory's young minds. In a public missive on the initiative through the Government Information Service (GIS), Premier and Minister of Finance Hon Fahie said he is happy with the progress made by the Ministry of Finance, especially Dr Drexel Glasgow and his colleagues at the Project Management Unit to get this project completed for the new school year in September this year. “Since taking office, your government has designated this project as high-priority so that our junior students can once again attend school full time at this site. Our senior students will continue school at the CTL Building, but now they will attend school full-time,” Hon Fahie said. Further, the Premier added that contracts for the internal works on the L-shaped building will be signed as early as next week. He expressed appreciation to the principal, assistant principals, teachers, support staff, students and parents of ESHS for their patience and tolerance with the matter from September 2017 to the present. Man on a mission. For his people, by his people!!!! How come they have ndp on this project?
" social commentators have long commented that the shift situation is not ideal, especially when it comes to the education of the Territory's young minds". Yet BVI students have outdone other regional jurisdictions during this difficult time. Social commentators should not forget to mention this. Good PR does not mean truth! Who have we outdone? By what standards? What are the real numbers and statistics? Don’t be naive. I hold no brief for the former minister, but the head of CXC seems impartial and disinterested enough for me to believe and accept his comments that this is the case! Hurricanes Irma and Maria, two catastrophic category 5 storms, slammed the BVI and damaged/devastated buildings, structures, linear structures, infrastructure, utilities......etc at an estimated replacement cost of $3.6B. ESHS, the largest high school in the territory, was ravaged. As a result, the old CTL building is being used a temporary make shift high school, operating on a shift system. This facility is too small and not ideal for students to attend school on a full time basis. It is urgent and important for students to attend school on a full time basis. It is commendable and encouraging that efforts are being made to rehab ESHS so that students can attend school on a full basis. Moreover, ESHS sits on approximately 8 acres of prime real estate in Road Town, Tortola and VI capital city. However, the current layout of the campus is not maximizing land use of this piece of prime real estate. Though the 2017 hurricanes devastated the territory, the silver lining, if any, provides the opportunity to do things differently. The ESHS needs to be redesigned and reconstructed to modernized it, as well as maximized the land. The school needs to be razed and resited; the new school should include cafeterias, gymnasiums, laboratories, sport facilities, learning resource center......etc. Currently, the territory is without a central library. Well, a joint ESHS-Central Library can be explored as part of a modernized ESHS project scope. Further, a modernized ESHS should be designed and constructed to withstand major hurricanes, ie, category 3 and above and can be used as a rideout shelter. No doubt this proposal will be costly, take time, and delay the rebirth of ESHS. Nonetheless, sometimes it pays to be visionary, bold and dream big, looking beyond the rainbow. Eondorse the redesigning, resiting, reconstructing and modernizing of Elmore Stoutt High School that was severely damaged by hurricanes Irma and Maria. However, a temporary plan is needed to house the students that are currently being housed at the old Clarence Thomas Building. Perhaps some portable classroom buildings can be acquired to house the students. The portable, demountable and relocatable buildings can be purchased or leased. Work is being put in place on the old footprint so no change may be a done deal. Six of one and half a dozen of the same. Samo, samo. Let’s fly and soar like eagles, not careened off the cliff like buffaloes .